Children with ASD may be more susceptible to dental decay. 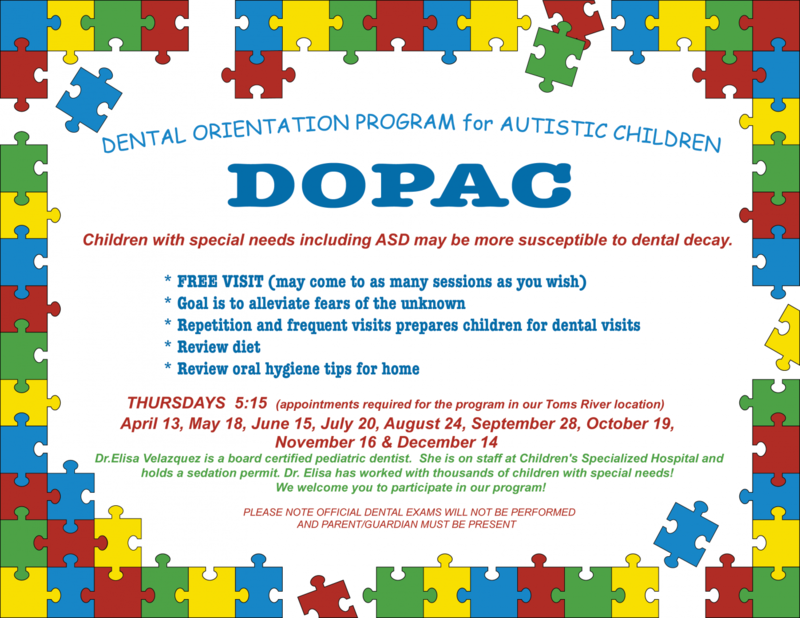 Children with ASD may not be willing to receive dental care. Parents of children with ASD may be fearful or nervous and not start dental care early. Our goal is to teach dental hygiene and orient children to a dental office to alleviate fears and promote dental care. Appointments required for the program in our Toms River location. Dr. Elisa Valezquez is a board certified pediatric dentist. She is on staff at Children's Specialized Hospital and holds a sedation permit. Dr. Elisa has worked with thousands of children with special needs. We welcome you to participate in our program! Please note that official dental exams will not be performed and a parent/guardian must be present.